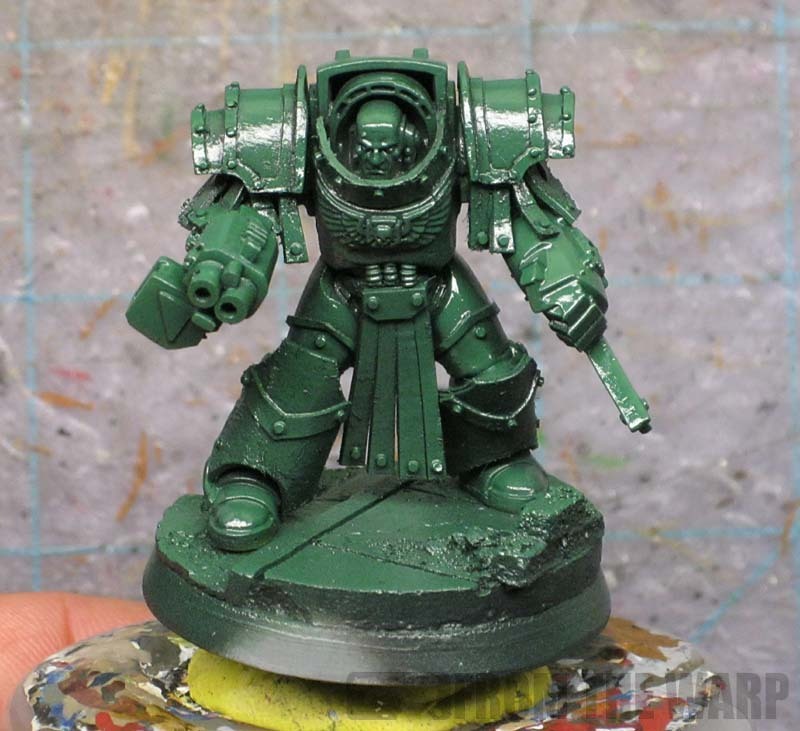 I started this conversion the other day as a way to see if I could convert my own style of Cataphractii terminator armour. I have to say that painting him has certainly helped with the conversion. I used Forge World's scheme since I really like how the darker green looks. Normally these guys are seen as a much brighter and pale green, but I think the dark green looks pretty sharp. 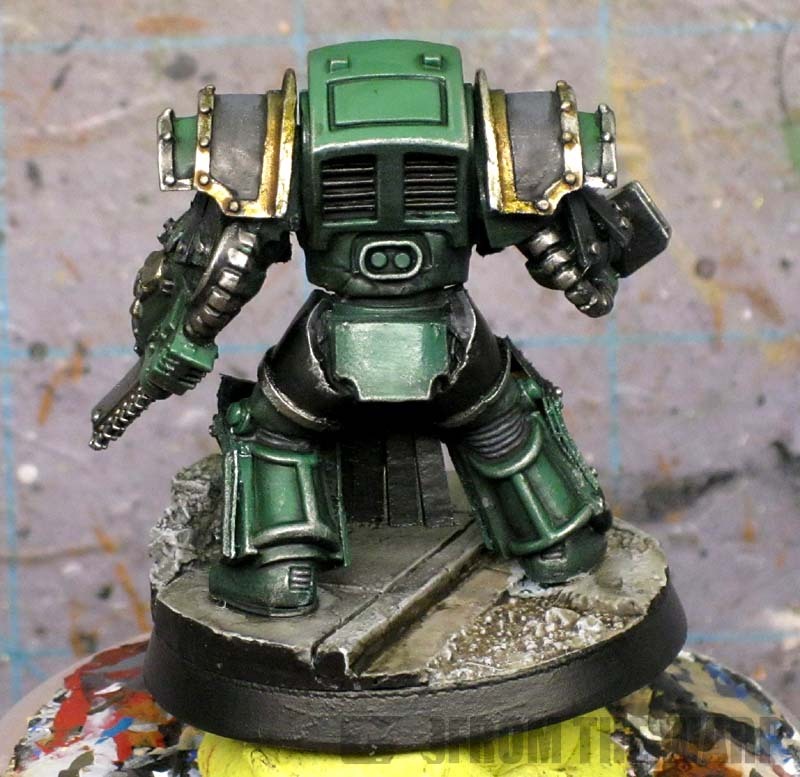 As far as painting, I started out using the exact same approach I used for my Dark Angels. The green spray basecoat over the black primer. Form there, I added my metallic details and spent a little bit of time working on the face since it is the focal point of the model. I opted to make his base a light color to contrast against the very dark model. A good discussion on that concept can be found here. I also toned my weathering down considerably on this guy and really tried to make sure I didn't over do it. The painting does help hide some of the model's imperfections and gives you a much better feel for how he looks in the end. Sometimes it can be hard to imagine how a model is going to look in the end. I think my favorite aspect is that this guy actually feels Pre-Hersy to me. I like the idea of Space Marine legions and not tiny chapters. There's something about that idea that is more "40k" to me than what Space Marines are today. I'm hoping to get my hands on the new Betrayal book from Forge World to see what else is out there from this period. As a small side note, I was careful in how I applied my shading washes as well so that I could keep the highlighting effect I had with the spray paint. I think it helps the model much more than just covering the whole thing with a couple washes. It takes a few more minutes since you have to think about where you're applying your shading, but it's worth it in the end. I think you've just made it seem achievable. 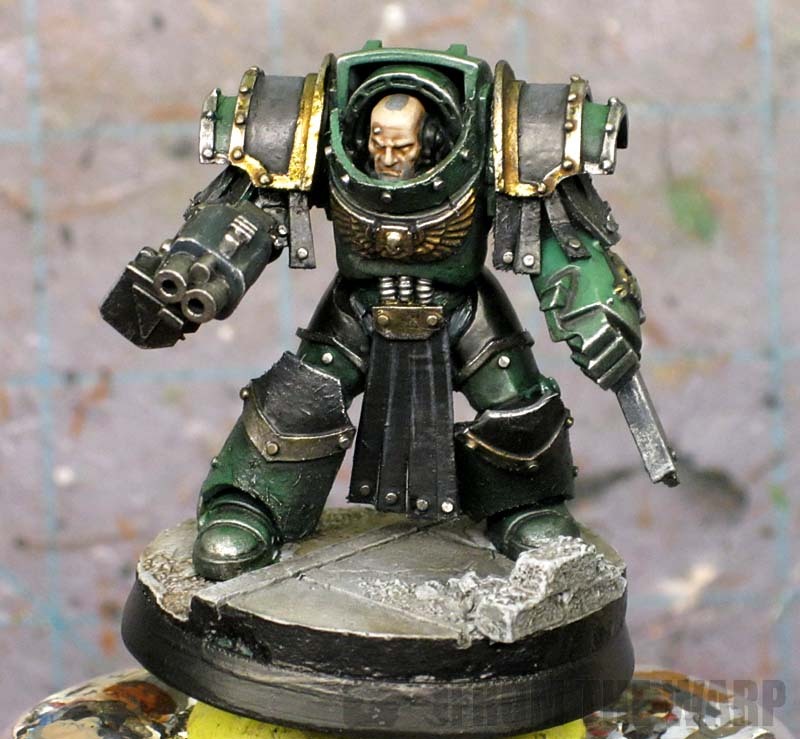 Wow I take my comment back about asking you to paint this guy in a pre heresy death guard livery, this looks really nice, I have a thing for dark green and this just looks wow. Zab says exactly what I was going to say, the cardboard adds a hammered texture you don't get with green stuff, you just have to look at his thigh plate [which are super smooth and also cool looking because you have the areas with texture and without]. People often forget that materials have different textures when they're modeling. wonderful work, I specially like the paragraph where you state the importance of basing, I will always back that a lot. great work. Favourite part of the whole model is the mohawk. Often neglected part of a mini I find. If the model looks bald people leave it bald instead of painting short cropped hair which adds so much. Splendid. What color of weathering do you think will work on this kind of green armor beside metalic steel-ish when you think of heavier weathering? Darker green? Black? I really like how this turned out. I'll definitely steal a few of these ideas for my Obliterators. Think you'd be interested in doing more 'Horus Heresy on a budget' articles? Wow this looks even better with paint. I'll definitely be attempting this when I get more hobby time. I agree with what others have said the texture of the shin plates and the mohawk really make it stand out. Zab: I noticed that too. It's the texture of the cardstock as the paint built up on it. It works, but you're right... I'll never pull that off again. Werner Fernando Oroxon Ramirez: Basing makes a huge idfference in the end. It can take a bsic model and elevate it to the next level. TheAmbit: The mowhawk is one of those small touches I try aand add here and there to give the model a little more detail. David: You could add grime and such, but as far as weathering, you could use any color that matches the environment you've put your model in. In this case, I could use a light grey color to simulate concrete dust and such. JW: Absolutely. As I see more of the Pre-Heresy things that come out, I'll be trying them on my own. Keep in mind that this really only works if you already have the models. The actual FW ones aren't too much more expensive and would asave you the time of having to convert every guy. skoby: The paint hides some more of the minor imperfections on the model. It helps pull it all otgether and create the illusion where seeing it as a WIP does't do that. Very stunning conversion and paintjob! Looks like the FW model, that's impressive.